12 to 24 V AC/DC powered Relay and 4-20 mA output fully configurable gas detectors. 7 sensor types. 100 to 240 VAC powered gas detectors with Relay and 4-20 mA output fully configurable. 7 sensor types. Suggest a configuration for high voltage adaptor early in the design process that reduced 3 PCB layouts to one saving 50% of the PCB development costs while reducing the BOM complexity, manufacturing steps and manufacturing costs. Select components, PCB layout and hardware testing. Mechanical design of enclosure. Sourcing mold and providing technical requirements. 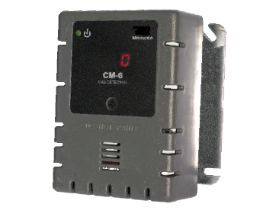 Designed to meet UL requirements and worldwide electrical safety requirements. Designed and made production process and equipment: functional test jig and Hi-Pot test jig.